This section is by no means comprehensive. This is just a small list of problems that I have experienced personally, and how to correct them. Splayed legs (a.k.a. spraddle legs) occurs when the chick's legs begin to do the splits. 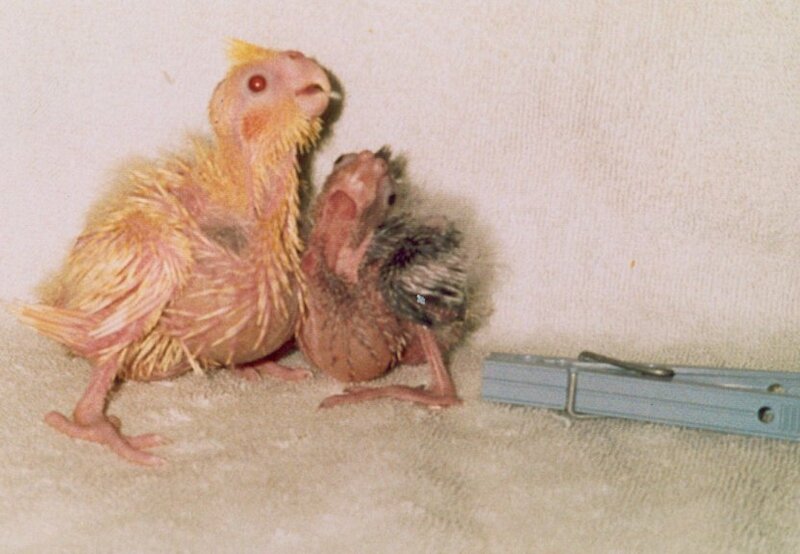 All young chicks may have trouble keeping their legs in order, but if their legs refuse to stay under them then you have a problem. Splaying can occur at either the hip or the knee. Most cases of splayed legs are extremely easy to remedy, so long as they are treated early. Paper/masking tape should be used to tape the two legs together underneath the body in the normal perching position. Do not tape them too close or too far apart. Paper tape works the best, as it does not cling too much yet is fairly flexible and easy to remove. Vetwrap is not strong enough to remain on a wiggly chick. Surgical tape is much to sticky, making it extremely hard to remove without damaging the thin skin. The tape should be changed every other day; more often if it becomes too soiled. Mild cases can be corrected in just a few days, while severe cases may take weeks. A few cases may not be correctable. Every so often you'll find a dead chick in the box covered with ants. Such cases are rarely caused by the ants themselves. Most likely the chick died of other causes and the ants are just there for the carcass. Cracked eggs also double as ant magnets. Red mites like to attack my chicks on occasion. Usually they go after chicks that are somewhat malnourished or neglected by their parents. Fortunately, mites are easy to prevent and to cure. Go to a hardware store and find the pesticide department. Look for a chemical called Sevin. You want the powder form, not the liquid. A pinch or two mixed with the bedding material will prevent mite infestations. If you already have chicks covered in mites you can dust the birds themselves. Sprinkle the dust on your hands or use a Q-tip to apply Sevin on the back, under the wings, etc. I do dust the head but try to avoid the nostrils and eyes. It may take several days of application but you should begin to find dead mites falling off the birds. While Sevin is a poison, I have never had a problem applying it directly to birds. It can also be used as a flea powder on dogs and cats. Stunting can be caused by a variety of factors: parents not feeding, improper/infrequent handfeeding, poor handfeeding formula, sour crop or an infection. Whatever the cause, it needs to be solved immediately. 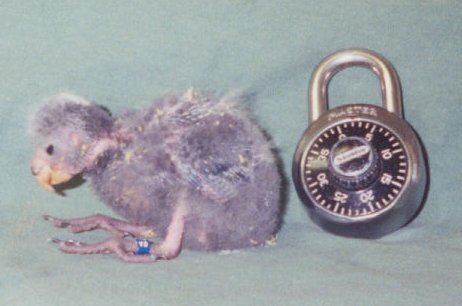 It is extremely hard for chicks to catch up once they get behind in their growth. Malnutrition will cause chicks to grow very slowly, if at all. They may appear dehydrated and thin (especially the feet and legs). Because the feathers tend to come in as scheduled regardless of nutrition, these can often be used as an indicator of true age. 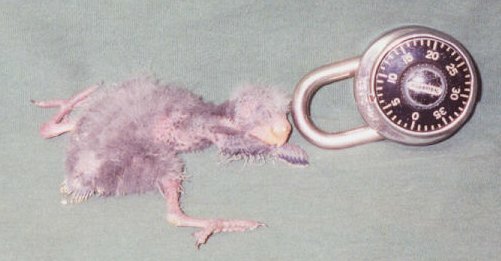 A stunted chick that looks two weeks old in size may have four week feather development. Solving stunting can be difficult depending on the cause. Some solutions should be obvious like increasing feedings or switching from a hand made formula to a store bought one. If the pair is to blame you should either pull the chicks for handfeeding or foster them under a better pair. If neither solution is possible you can also supplement the chicks with in-nest handfeedings. Sour crop and infections are harder to deal with. Experienced breeders may be able to handle these on their own, but most other breeders should seek out a vet if the crop is not emptying properly. 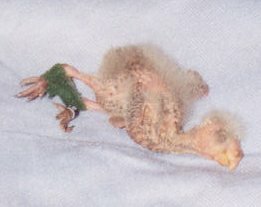 A stunted chick beside a normally developed one. The larger chick is actually several days younger than the stunted one. Clutch of stunted tiels. These guys also had sour crop. Note the thin appearance and red, dehydrated skin. Mutual plucking between pairs is almost as common as mutual preening, and it is not the type of plucking I'm talking about here. By plucking I am referring to the plucking of chicks in the nest. No one really knows what causes the behavior, though several theories have been thrown out, from malnutrition to boredom to the pair wanting to return to nest. Whatever the cause, once it becomes a habit it can be very difficult to break. It may be both birds or just one. While removing the guilty party is feasible, this places a heavy burden on the remaining bird. 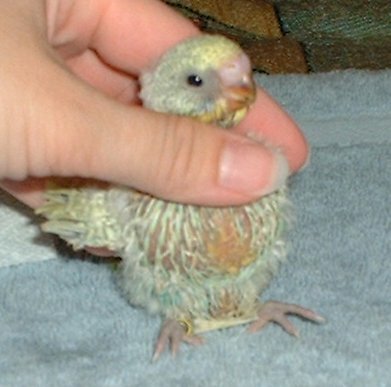 Some pairs start on the chicks when they are older, then gradually begin to pluck pinfeathers too. Eventually it may lead to mutilation. I recommend pulling every single chick just before you know the parents will go to work on it. If you can't handfeed then foster. I've had pluckers stop after the repeated removal of their clutches before the plucking began. Some pairs may never stop. You may want to try re-pairing your birds to see if the behavior continues with a new mate. Articles and images contained on this site are © 2004 by Karen Trinkaus unless otherwise noted and may not be reprinted or used in any way without the author's permission.